All things considered, not a bad debut. New Carmine Hoser Brandon Phillips (wearing uniform number zero) clouted a two-out, two-run HR in the top of the ninth to deliver a 9-8 win for his new team. Phillips took a "Ruthian" swing—with a big recoil—as he launched the "no-doubter" deep into the left-field seats. 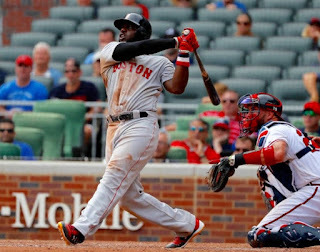 Boston fell behind 7-1 (thanks mostly to a horrific "relief" outing by Drew Pomeranz) until they exploded with another monster eighth-inning—scoring six times to tie the game. Of course, the bullpen could not hold the tie—as Brandon Workman coughed up a solo shot to Freddie Freeman. Then, the Miracle Ninth. Andrew Benintendi (three hits on the day) got it started with a one-out single (off a lefty). 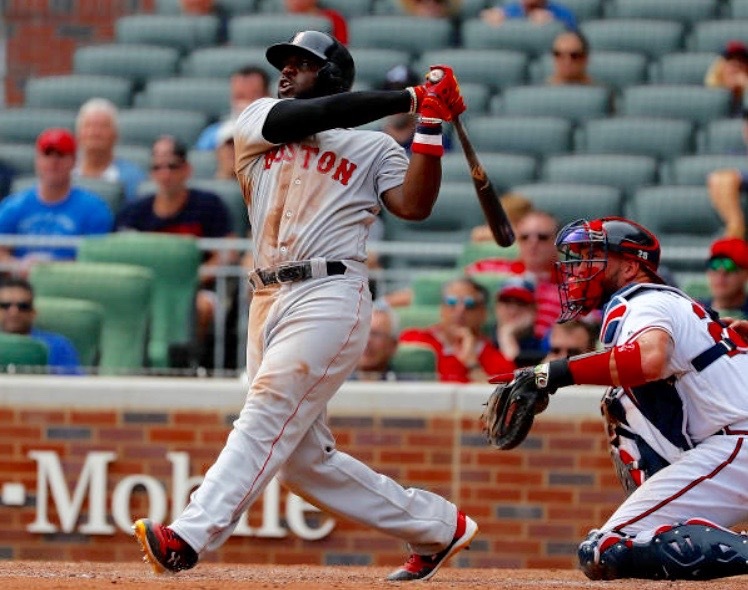 After Steve Pearce struck out, Phillips insured he would never pay for a meal in Boston with his decisive blast. The initial, 8th-inning comeback was fueled by five straight hits to lead things off—capped by a two-run single by Ian Kinsler. Phillips, Kinsler and Blake Swihart each contributed two RBIs. The win drops the Magic Number to clinch the AL East to 14. * Headline suggested by FenwayNation friend and fellow baseball nut Ellen Adair.